I've been been really busy reorganising my craft room and all my storage - so busy, I haven't posted for ages! So big apologies. I've used a base colour of Rustoleum Chalky Matt Furniture paint in 'Chalk White' on both sides of the hangers (allowing one side to dry before painting the other side). It's worth being patient and allowing the paint to dry naturally, as MDF absorbs paint, so you can see if you need to apply a second coat. I then stamped a text design over the top (again allowing to dry before stamping the other side) using a calligraphy mat from The Artistic Stamper (no affil) It's mediaeval and Italian, no idea what it says, but it looks wonderful. The paint is Americana Decor Chalky Finish in 'Primitive', a really subtle griege. The outer case has the same antique white as a base coat, then crackle glaze topped with matt finish pale sage green acrylic (PaperArtsy in 'Guacamole'). I decided to keep this fairly plain, as it's up on a shelf and against a wall, so you don't really see it - although I did paint the back as well. If you're going to do it, do it properly. Yes, I also painted the inside as well using the same Rustoleum Chalky Matt Furniture paint in 'Chalk White' on the raw MDF - it only needed one coat. 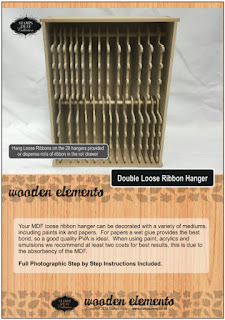 You can buy a pack of 14 hangers if you don't want the entire kit (stand with 28 hangers) or you need even more hangers. Now all my ribbons and lace are on show, so I actually know what I have! Genius or what? This was as much fun to decorate as it was to get some of my vast ribbon stash finally sorted out.